In this episode of RealLifeTV, Justin teaches correct pronunciation of the American “T” Sound, one of the most confusing sounds to pronounce and comprehend for most English learners. This lesson will drastically improve your comprehension of American and Canadian English. If you haven’t subscribed to RealLifeTV, the RLE Youtube channel, check it out here! Below you’ll find a transcript. This is also called a soft “d,” fast “d,” flap “t,” or the “t” between vowels because it normally happens between two vowels. But it happens in many other situations too. Better: They say Better, “BeTTer” there sometimes. City: “CiTy” in those countries. “CiDy” (American pronunciation). Computer: “CompuDer” we say in the United States as well. 13 (“Thir-Teen”) —— 30 (“Thir-Tee”), they sound very similar (British Pronunciation), and if you’re not paying attention you can get them confused, so I teach 13 (“ThirTeen”)—— 30 (“ThirDee”) because it separates them and makes them much more distinct. If you notice on all of these, tens- “thir-Dee,” “four-Dee,” “fif-Dee,” “six-Dee,” “seven-Dee,” “eigh-Dee,” “nine-Dee” that the “T” turns into a “D.” So, that’s a really clear example of this. So that’s a really interesting example. So this is connected speech, this is when we actually shorten the words, we shrink them, we link them, and we morph them. So this is the way we really speak. This is not informal, this is the standard American accent. It’s the way we speak in a job interview, as well as with friends, so pay attention to this. I really recommend that first you learn how to understand it, to hear it, to recognize it, because this will open you up to movies, music, TV shows, and it will help you really participate in English speaking pop culture. 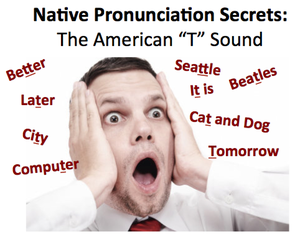 From there, you can experiment with it, do exercises, see if you can pronounce the word “better” (“Be-der”) or “Seattle” (“See-a-dul”), and practice that a little bit and you can play around and start using it. From there, you don’t need to do this, but it might help your English, it might help your flow of your English. So, that’s today’s lesson. I hope you enjoyed. There’s also an article that I wrote about this in the information box below. Feel free to click on that and go to our website and check that out. Also, if you’d like to receive more lessons like this, click on subscribe right here and we’ll send you more videos like this. Thank you very much. Take care. Thank you very much!It is interesting.I have learnt something new in terms of American pronunciation. Thank you very much. .
Really useful information for me. Dat video made me a bedder teacher. Thanx! Thanks you so much.. for a great lesson.. Very interesting and useful lesson! Thanhs a lot!!! No-one should be wasting their time learning a non-standard dialectal variation that makes them sound thick. T is pronounced T. End of story. Okay, tell that to the 255,000 Americans who are native speakers who pronounce T as D (that’s 71% of the world’s 360 million native English speakers). Just because somebody is expressing a disagreement with you is no reason to knock it. And yes in my response I have been knocking you as well. I don’t like resorting to that but felt it was necessary to show you being on the other end of that doesn’t feel to good. And since you value kakerlakes opinion enough to send a response. That shows you do care about others opinions. Why would that make anyone sound “thick”?? Wow. I love this. Excellent. Justin Murray Nobody cares how many number of speakers pronounce a t like a d; nowadays idiots are going on social media using words like “I dunno” when they mean, “I don’t know”. I guess you believe the former is now the proper term. If kakerlake was ripping the English people for pronouncing peter (pe-T-er) and telling them to say peDer! I guarantee you wouldn’t have thrown him under the bus like that. But you’re just an over-sensitive native American. You better claim American as you’re ethnicity and not white, cuz then you would be a sellout. Btw the word “ho” was an accent used by American blacks for whore. Uh oh, are you too coward to go to south central LA to “correct them” or what? On the topic of blacks, at one point in the 1950’s the vast majority of “Americans” strongly believed blacks belong in the back of buses, and if they didn’t they should be prosecuted to the fullest extent! But the law changed. Maybe not the minds. You need to get with the times little man. Thanks for reading and responding, Ned! Not trying to knock it, just sharing the facts. All the best, my friend. Hey Ned, no need to get disrespectful. This is a place for discussion and global citizenship. Take care and I hope you enjoy the blog! Hey Juliette, awesome to hear that our content is helpful! Yeah, it definitely sounds like you got this. And let us know if there’s anything else we can do to help. One of the things that’s helped me the most with my students is motivating them to integrate English into their lives. Here’s a great article for that — https://reallifeglobal.com/permanent-english/. Take care! Thank you, and thanks for that article. One question though, since this is my first time actually tutoring a Brazilian person, and therefore my first time encountering the unique “issues” these speakers typically have with English. Do you have any suggestions for where to start first with my student (also considering this a business context, where I come to his office and help him w/English..). Thanks! How about you just pronouce it the real way instead of of continuing to make yourself sound thick.